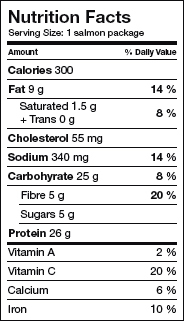 A unique way to prepare a wholesome meal in one pouch: high in protein and omega-3 fats, low in odour and with easy clean up. 2. Combine the couscous with the dill, water, lemon zest and half the lemon juice. 3. Cut 4 sheets of parchment paper about 3 times as long as the fish fillets. 4. Place an equal amount of the couscous in the middle of each of the 4 sheets. 5. Place fish fillets on top of the couscous. 6. 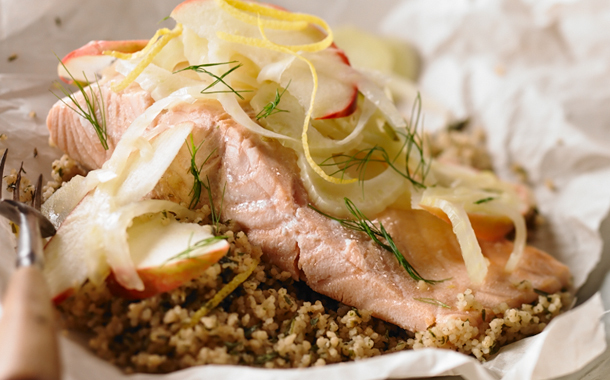 Top each fillet with apple and fennel slices. 7. Season with lemon juice, olive oil and a pinch of salt. 8. Fold the top half of the parchment over and crimp and fold the edges about 1 inch at a time until you make your way around the entire parchment package. You want to create a fairly tight seal. 9. Place the four packages on a baking tray and bake for about 15 minutes.